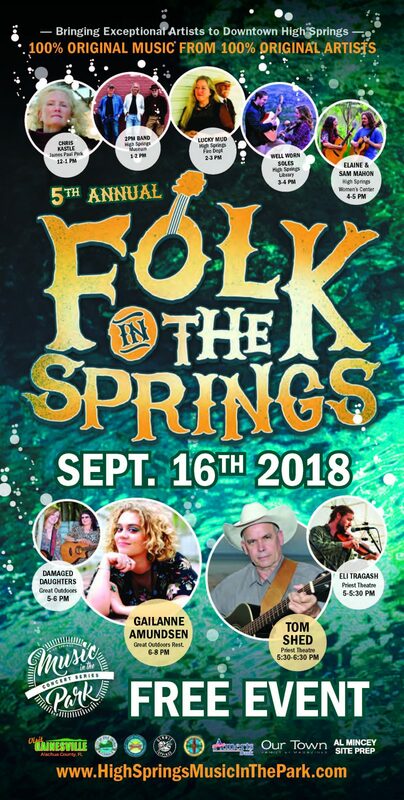 High Springs Music in the Park & Concert Series Inc presents: Folk in the Springs, a free community event, open to the public to promote both local & state Artists and our Historic Downtown High Springs. Our fifth-year hosting Folk in the Springs bringing acoustic artists from all over Florida to perform in the Historic Downtown District. A walking tour of our downtown area: James Paul Park, High Springs Community Center & Museum, High Springs Fire Department, High Springs Library, GFWC High Springs New Century Woman's Club, Priest Theatre and the Great Outdoors Restaurant. Elaine Mahon ~ (Gainesville) over 25 songs of the Roots Music Report for Contemporary Folk. Lucky Mud ~ (Lynn Haven) 40 year veterans of Florida Swampy-Tonk and Folkabilly. 2PM Band Florida ~ (Tampa) trio of veteran talented musicians who blend their varied musical talents. Chris Kastle~ (St Augustine) Singer-Songwriter/ Storyteller/Artist/ Author/Educator at Sextant Music,Ltd. Damaged Daughters ~ (Micanopy) Americana, bluegrass, rock to originals with strong female influences. Well Worn Soles ~ (Homosassa) Referencing vintage roots and age-old themes. Eli Tragash ~ (Gainesville) Bringing the traditional sounds of yester-year on his aged ol fiddle. Last year the attendance was estimated at 1000+ for this one-day event. Our sponsors include: Visit Gainesville/Alachua County, City of High Springs, High Springs CRA, Ginnie Springs Outdoors LLC, Great Outdoors Restaurant, High Springs Chamber of Commerce, Ameris Bank of High Springs, Out Town Magazine, Al Mincey Site Prep and more. Another good reason to visit High Springs, Florida Come and Enjoy our Nature! High Springs Music in the Park and Concert Series Inc is a Florida 501 (3) (c) non profit, non business, all volunteer organization where all proceeds goes back into the charity.